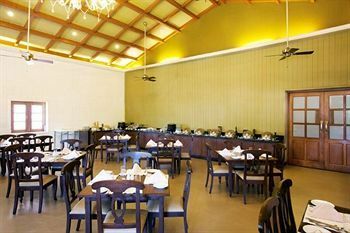 Located near Ettinnes Rd, Hotel Club Mahindra Derby Green is a well-known hotel in the Nilgiri district of Tamil Nadu. The hotel is located at a height of 2.240 meters. Hotel Derby Green is in fact an integral part of the Queen of Hill stations, Ooty. The hotel is located around 88 kms away from the nearest airport. Similarly, the railway station is situated 88 kms away from the hotel. Tourists can also explore the nearby attractions like the Botanical Gardens, Hindustan Photo Films and the Government Museum. If you have enough time you can also visit Kodanadu's View Point, Lalit Kala Academy, Kamraj Sagar Dam, Ooty and Radio Telescope. Some of the other activities you can indulge in are taking a long drive to Fern hill and then jungle trekking. Doctor on Call, Backup Generator, Restaurant, Front Desk, Taxi Services, Parking, Complimentary Newspapers in Lobby. Room Heater, Dustbins, Wardrobe, House Keeping, Attached Bathroom, Desk, Makeup/Shaving Mirror. User reviews for "Club Mahindra Derby Green Resort Ooty"